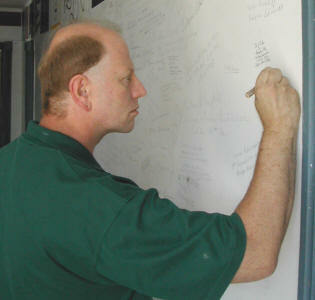 — The Pews of St. James — More Families Sign the Wall! 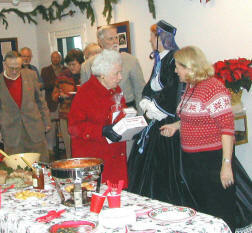 Friends of the Brandy Station Foundation enjoyed an Old Time Christmas Celebration at the Graffiti House Saturday, December 8, 2007. 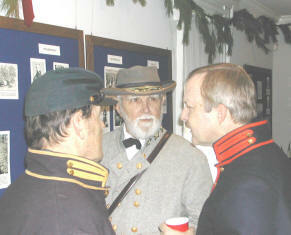 Well over 100 people – including Robert E. Lee (George Wells) and St. Nick (Dale Brown) – attended. 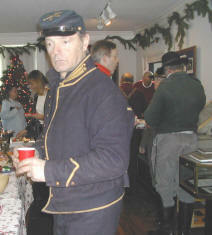 Several re-enactors also attended adding the picture of their period attire to the decoration of the party. The work of organizing the party and decorating the Graffiti House was led by Peggy Misch with a strong team effort of Mary Tholand, Tony Seidita and Helen Geisler. 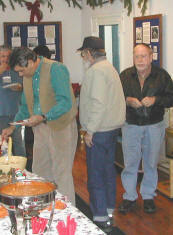 Music was provided by the Wilderness Run Players (Bob Pfile, Jan Moore, Sandy Wemmerus and Eric Stohr) and headlining the food dishes were meals by Ed Gentry’s Catering and bakery goods by Karla Seideta. 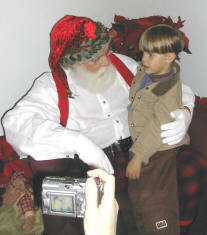 However, to this writer’s eye, the hit of the party was St. Nick. 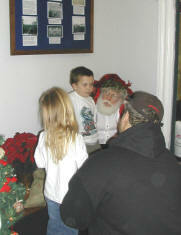 Many children – young and old(er) shared their secrets and wish lists with him. 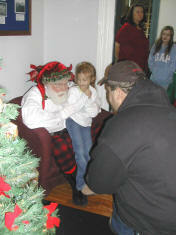 Many pictures of the party, and of the kids visiting with St. Nick, are shown below. 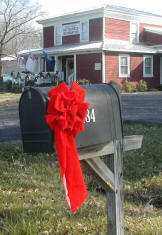 The mailbox was decorated even the old cannon and the front porch looked great. 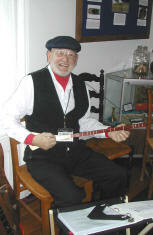 Carla's bakery goodies were a hit Tunes by the drum-stick man - Bob Pfile Can you play Dixie? On October 17th, a contract was signed with the firm of Daliglish, Gilpin and Paxton for the preparation of a Graffiti House Architectural Evaluation report. This report will identify all outstanding facility problems within the Graffiti House, prioritize their importance, and identify proposed best solutions – complete with estimated cost and schedule implications. Upon completion, the report will be submitted to the Board of Directors of the Brandy Station Foundation for its review. The Board will extract appropriate pieces of the report and formulate a plan for the restoration/preservation of the Graffiti House. This plan will be the baseline document by which the Graffiti House story will be described and be the standard upon which success will be measured. Many thanks to the Procurement Selection Committee (Della Edrington, Chair; Bob Jones, Bob Pfile, Dan Painter and Gary Wilson) without whose hard work and dedication this important step would never have occurred! 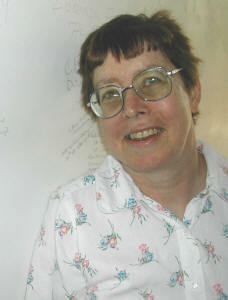 On November 7th, the Graffiti House was visited by a team of reporters from National Public Radio. 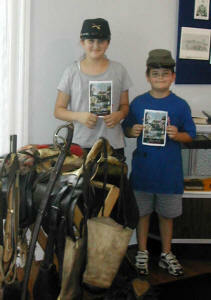 They came to the house to learn the story of the House and to see first hand how history is uncovered. Kirsten Travers, a paint history specialist, who had previously uncovered several drawings on the Graffiti House walls, drove down from New York City to also be part of the broadcast. In all, the NPR team recorded about three hours of activities which eventually were consolidated into a manageable segment for a radio broadcast. On November 24th, the broadcast occurred as part of the nationally broadcast show, "All Things Considered." Click here to see that broadcast..
Rose Hill Festival a Success!! 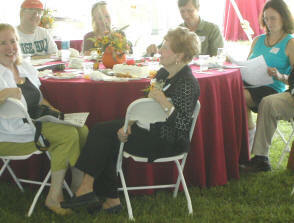 Over 160 friends of the Brandy Station Foundation gathered on the spacious lawns of Rose Hill on October 6th for an afternoon of fall festivities. Our hosts for the afternoon – the Covington/Wells families and the Rose Hill Farm Director Walter Bell – were extremely gracious and had provided the magnificent venue of the estate for our use. As you can see from the below pictures everyone had a great time! Special thanks to Belmont Farm Distillery, Copy Right, Inc., Elkwood Crossing Nursery & Garden Center, Old House Vineyards, Prince Michel Winery, Tom Calhoun’s Meat Market, Yates Properties and Gentry Catering for your support. Individual thanks are also due Bud Hall, Margaret Misch, Dan Beattie, the Deardoff family, Deanna Scott, Butch Davies, Sami Colvin, Brooke Colvin Kelsey Propps, Bob McDougal, the Little Fork Rangers, quilters and dulcimer players. It survived the Battle of Brandy Station. It survived the movements of Jackson and Pope in 1862. 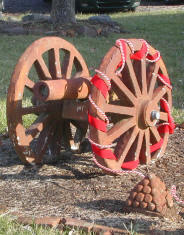 It survived the movements and fighting of Lee and Meade in October and November of 1863. But it could not survive men who wanted to live in a little more comfort. And for the men of the Army of the Potomac, it wasn’t a decision to make. The St. James Church came down, literally brick-by-brick. When the orders came to build winter quarters, the church was an easy target – it was Convenient and empty. The most likely candidates for the removal of the bricks and structure was the 6th U.S. Cavalry Regiment. They were camping in the field immediately adjacent to and northeast of St. James. This field five months previously saw the 6th Pennsylvania Cavalry, known as Rushes Lancers make their charge on the morning of June 9th, into the mouth of the might of the Stuart Horse Artillery, with predictable results. Lt. Henry Carpenter of the 6th U.S. Cavalry described setting up his winter camp “upon the battle field of Beverly Ford or Brandy Station as the rebels call it... An old Church stands close by...The ground near the Church is covered with the graves of rebel soldiers... (Carpenter, L.. H., 1863 Letter in Louis Henry Carpenter Papers, Historical Society of Pennsylvania). Trees in the churchyard and cemetery disappeared to provide wood for huts and fuel. As chimneys were also required for warmth during the winter, the little brick church was at risk. But what happened to the pews? That answer comes from the diary of Elisha Hunt Rhodes the adjutant of the 2nd Rhode Island Infantry Regiment. He described the dedication of the regiment’s chapel in mid-January 1863: “Tonight we dedicated our new chapel and in remembrance of R.I. and in recognition of God’s goodness to us we have named it “Hope” Chapel. The building is made of logs hewn smooth on one side and built up cob fashion. Most of the hewing was done by Chaplain Beugless and Lieut. 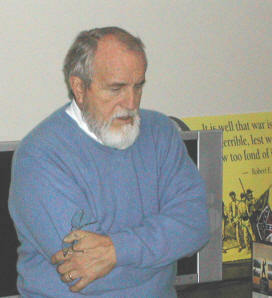 John M. Turner. The roof is covered by a large canvas, presented by the Christian Commission. Inside we have a fireplace and tin reflectors for candles on the walls. A chandelier made from old tin cans, or the tin taken from cans is in the centre. The pulpit or desk is covered with red flannel, and the ground or floor is carpeted with pine boughs. We sent a detail of men in command of Capt. John G. Beveridge to a deserted church near by and took out the seat and placed them in our Chapel. Our boys had a fight with the guerillas but brought back the seats.” (All For the Union: The Civil War Diary and Letters of Elisha Hunt Rhodes, edited by Robert Hunt Rhodes) Rhodes was also the superintendent of the Church’s Sunday School. The seats remained with the sixth Corps Unit until April, when the packing of the camp and preparations for war began anew. The canvas roof was returned to the Christian Commission. As for the pews, no one knows. They were most likely taken from the roofless church and used for firewood. By April, most of the hardstand trees had been used, and the benches were convenient and close. While we will never know for sure of the fate of the pews of St. James Church, we can be glad that at least they were used for their designed purpose for a few more months. 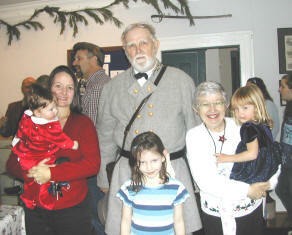 The Brandy Station Foundation (BSF) hosted a “Spirited Evening at Brandy Station” on October 26, 2007. 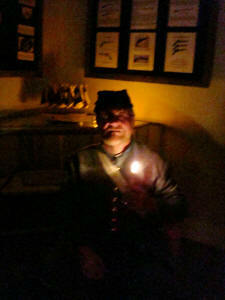 Over 50 brave souls walked the hall of the Graffiti House to hear tale of the ghosts and other unexplained events relating to Culpeper County’s involvement with the Civil War- as well as modern ghost stories with a Civil War theme. The guests were greeted on the front porch by Ms. Peggy Misch who spoke of the current occupants of the Graffiti House and experiences of former owners, visitors and the Graffiti House staff. Those who were able to complete the internal journey (and all did- including a very brave four-footed friend), were treated to a warm bon fire, roasted marshmallows, hot apple cider, popcorn balls and other goodies. Thanks to Chris Block, and from Fauquier High School: Jesse Jorgenson and Chris Spoden for overseeing the bon fire and keeping all safe. Mrs. Della Edrington served as hostess for the event and Caryn Block was the event coordinator (who also seemed to arrange for a spectacular full moon to rise during the evening). If you missed the stories, don’t worry, plans are underway for next year! THE OLD Graffiti House in Brandy Station is pitch-black dark. 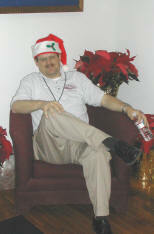 As I sit in a chair, my back to the wall, a man named Ron walks down a central hall quietly asking questions. Is there anyone here?" "Are you a soldier?" "Are you waiting for a train to take you to Richmond or to Washington?" "Has Gen. Lee been here?" "Were you wounded in the Battle of Brandy Station?" Ron's voice fades as he goes into a far room here on the first floor. His questions turn into statements of reassurance. "We are not here to harm you," he promises the surrounding darkness. For several minutes there is an eerie quiet, broken only by the occasional creaking of floorboards from the second story above. Then, still two rooms away, Ron coaxes whatever spirits that might be floating about in the darkness to manifest themselves in some way. "If you are here, make your presence known to us," the weekend ghost-hunter says. "If you are here, touch one of us in some way." For a few seconds there is absolute stillness and quiet and I sit smiling, thinking that this is all a lot of superstitious rot. Then, suddenly, I feel something touch my back, between my shoulder blades, just below my neck. It begins almost as a muscular twitching and I instinctively reach around to try and scratch the spot. Before I can get my hand up, however, the twitching sensation becomes more pronounced and now it is without question a tapping from without. Now I am smiling no more. Now the hair is standing up on the back of my neck. Now I have a strange feeling that someone or some thing is there in that 4-inch space between my back and the 150-year-old interior wall of this old Civil War field hospital. Then I hear a gentle thump on that wall, and I slowly turn to find that the large picture frame behind me is moving. It is the frame that is tapping me on the back. But how can it be moving? There is no breeze, no heater stirring air on this cold moonless night. And there is no freight train rumbling down the adjoining railroad tracks that might make the wall vibrate. But even a freight train wouldn't push a large picture frame 4 inches out from a stationary wall. What is doing it? You tell me, brother! I spent more than four hours in the dark Saturday night as members of a ghost-hunting group that calls itself the Virginia Paranormal Institute inspected the Graffiti House for spirits. 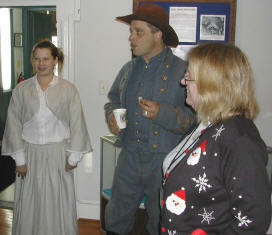 The small sliver group, headed by Mark Taylor of Gaithersburg, Md., had been invited by Graffiti House caretaker Della Edrington and the Brandy Station Foundation, which owns the pre-Civil War structure. Wounded soldiers--both Union and Confederate--convalesced here and many of their names remain scribbled in charcoal on plaster walls all over the house. Although there is no official record, some of the wounded undoubtedly died here. And since Appomattox, there have been reports of spirits residing in this place--and the unmarked graveyard behind an abandoned and now dilapidated church just a few yards away. If there are spirits here--as Edrington has often suspected--she wanted to confirm their presence. So she set up the investigation. So, Saturday night Taylor (a real-estate broker), Ron Pipilo (a truck driver), Rick Allen (a mechanic) and Jackson "Jackie" Hicks (a business owner) showed up with all kinds of sophisticated ghost-detecting equipment to search for spirits. Edrington was there and I was invited to attend and videotape the investigation for a TV documentary I am producing. Little did I know that I would become part of the story! About 7 p.m., all the lights were turned out and the hunt began. My "incident" occurred about an hour into the event after, I suppose, whatever spirits in attendance had a chance to become accustomed to us. After tapping me, however, whatever was there backed off, and it was at least another hour before the action picked up again. Then, in a small upstairs bedroom, Allen reported that one of his instruments was getting an abnormal reading beside the name "Bowman" scribbled on the wall. Hicks, who the group claims has a high sensitivity to the presence of spirits, volunteered to sit in a chair next to the name in an attempt to coax anything paranormal into action. We stumbled quietly up the old stairs (there were no lights on all night), went into the little room and shut the door behind us. Then Hicks began asking any spirits present to manifest themselves. "You can use my body," she says. "Just don't take too much of my energy." Her pleas go unanswered for several minutes and then, in the middle of a sentence, they abruptly stop. "I feel something putting pressure on my wrist!" she says quietly, trying hard to restrain her excitement. "Yes, something is there! 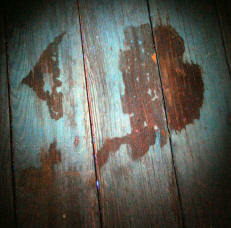 I feel it!" Through the viewfinder of a video camera capable of recording in absolute darkness, I see Hicks eyes widen and the tension in her body build. "It is moving up to my hand!" she says after a few moments. "It is like something is squeezing my hand!" Allen, who has been getting abnormally high readings on one of his instruments near the name on the wall, turns his attention to the woman in the chair. He brings the instrument down to her hand and it goes wild, with lights blinking on and off at a furious pace. "There is definitely activity here!" he says. For perhaps 15 minutes Hicks feels the pressure and Allen's instruments note some kind of abnormal energy near her hand. The living beings present in the room --including me--are all filled with excitement. Finally, Hicks feels she must free herself of whatever is touching her and she gets up. Edrington then sits down in the chair, to see if she can experience anything paranormal. After several minutes, she says that although she sensed there was something present, she really didn't feel the hand and wrist squeezing that Hicks felt. Allen gets no abnormal readings near her. "I suppose the spirits here are just used to me," Edrington, who works in the Graffiti House on a daily basis, says from her seat in the darkness. Minutes later we are downstairs again. Taylor shows us a picture of what he feels is a blood stain he found on an old floor. 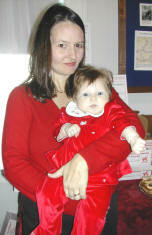 The photo was taken under ultraviolet light and will be analyzed later. Hicks is anxious and says she must go outside, that whatever touched her in the upstairs bedroom has drained much of her energy. "They sometimes do that," she says of spirits. I immediately think of Whoopi Goldberg, Patrick Swayze and Demi Moore in that scene from the movie "Ghost." Again, the hair stands up on the back of my neck. Are there ghosts in the Graffiti House? According to Taylor, the evidence is still inconclusive. He will continue to analyze photographs, sound recordings and videotape before he and other members of the Virginia Paranormal Institute (the four aforementioned people) offer an educated guess. As for me, well, I don't know what to believe. But when that picture frame started tapping me on the back there in the dark, well as the inimitable Barney Fife once said, "There are things out there that we just don't understand!" That night when I went home, I slept with the lights on! 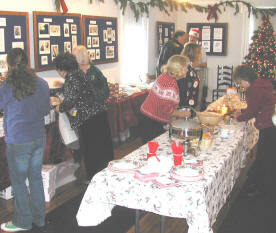 The Graffiti House was the location for a day of antique appraisals which resulted in a donation of nearly $1000. 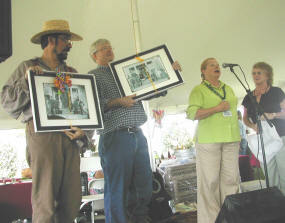 Sponsored by the Lake of the Woods Wilderness ‘Tiques, four appraisers evaluated antiques of all shapes and sizes. 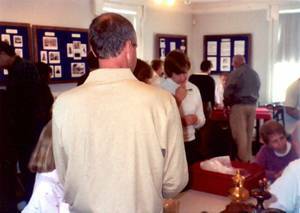 The local group, part of the national Questors Antiques organization, provided volunteers to collect fees and manage traffic flow. The appraisers, Sarah Hays of Quail of the Wood Antique Shop in Culpeper; Steve Hoffman, a professional furniture maker and appraiser; Clay Dodson, a private antique dealer; and Elizabeth Hammon of Cottage Antiques of Warrenton all donated their time and talents in support of Graffiti House restoration. The Brandy Station Foundation owes both the Wilderness ‘Tiques and the four appraisers a great debt of gratitude for their generosity. Gary Wilson has organized an outstanding 2008 Sunday lecture series, the topics of which are shown below. While the 2007 series marked the yearly highest attendance in the series since it was inaugurated four years ago; we have every expectation that the 2008 series will even be more popular. 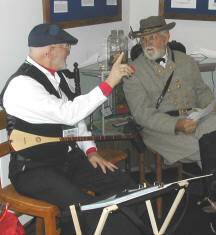 Gary starts the series with an encore presentation of “The Music of the Civil War” performed by Evergreen Shade (John Tole and Ann Howard). 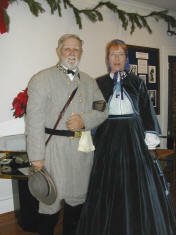 It should be noted that when John and Ann last performed in 2006, they set the attendance record at the Graffiti House!! One hundred and fifty years ago, in 1858, the Graffiti House was built in Brandy Station. A few years later soldiers passed through the village and scribbled on the walls of this brand new house! After the War, the walls were painted and the Graffiti was forgotten. During the 150th Graffiti House birthday celebration, the Brandy Station Foundation will present a chronology of the house, beginning with how it was built beside the Orange and Alexandria Rail Road. To assist with the telling of this tale, we have invited descendants of some soldiers who left their mark on the wall to tell their fascinating stories. 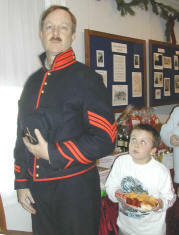 Join us for dinner and meet Broadus Bowman whose ancestor, Sgt. Allen Bowman, turned his bayonet into a hoe after the war (sword into plowshare). 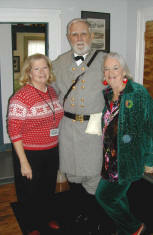 David Bridges will explain how a man from Maryland came to fight for the Confederacy. His name became part of an intricate drawing in the house that is dated March 16, 1863, the day before the Battle of Kelly’s Ford. Ed Kelley finds in his family tree an adventurer, J. Egbert Farnum, who sailed on board the last slave ship in American history. He goes on to become a Union Regimental Commander who wintered at Brandy Station and added graffiti to the house walls. 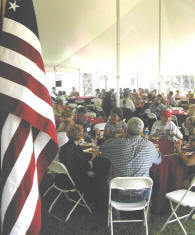 The dinner will also serve as the Annual Meeting for the Brandy Station Foundation at which time the membership of the Foundation will be presented with the slate of candidates for the 2008 Board of Directors. During the evening, Della Edrington will give a progress report on the Graffiti House Restoration Project. Over the past year, she has administered a grant from the Commonwealth of Virginia that has funded a study by paint conservator Kirsten Travers on the graffiti preservation and an architectural report prepared by the firm of Dalgliesh, Gilpin and Paxton. Learn about what more must be done to preserve the graffiti for the future. 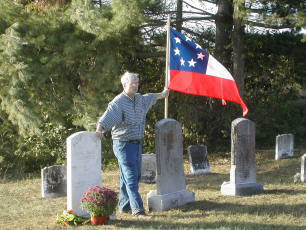 Also, please enjoy all of the local events during this Culpeper Remembrance Weekend. 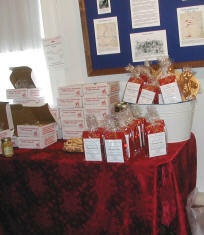 For more information about these events visit www.visitculpeperva.com. For your convenience, a block of hotel rooms have been reserved for the weekend. Contact Della Edrington at 540-825-4543. Cost: $25.00 for roast beef dinner, vegetarian selection available. Cash Bar & Wine. Brandy Station Fire Volunteer Fire Department Hall, 19601, Church Rd. or, if using credit card, you man email the information to us. TRAINING SESSION: SATURDAY MARCH 15TH AT 2 P.M.
Like to talk to people and share experiences? The Brandy Station Foundation is looking for you! From April through October, the Graffiti House is open four days each week (Wednesday, Friday, Saturday and Sunday) from 11AM to 4PM. This requires 160 hours of volunteer service each month. One person is needed downstairs to greet visitors, run the video and attend to the gift shop while another volunteer is upstairs telling the stories of the Graffiti. 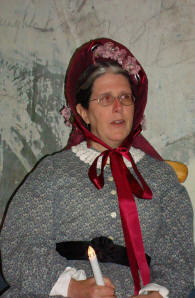 You are invited to join our team of dedicated volunteers who keep this National Historic site open free to the public. If you have a few hours to spare, please contact Della Edrington at (540) 825-4543 or by email. All returning volunteers and new volunteers are encouraged to attend this training session at the Graffiti House. 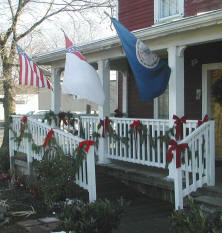 Positions available: Volunteer interpreters (tour guides) and Greeters to welcome house visitors, operate the gift shop and run the media center. 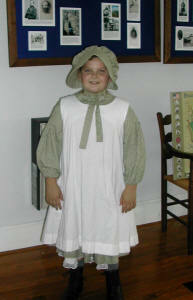 On September 22nd, nearly one hundred local home school students enjoyed an educational program that was presented by volunteers from the National Museum of Civil War Medicine in Frederick, Maryland. Although several limbs were amputated that day, it appears certain that all the brave young soldiers will survive. More Families Sign the Wall! Two more family members came back to visit the Graffiti House this past quarter. Paul Hawke, Head of the American Battlefield Preservation Program signed the wall for his ancestor Col. Alexander Boetler and Marcia Hovenden signed for her ancestor “Rooney” Lee. We also other visitors who did not sign the wall but certainly deserve their own pictures to be shown! 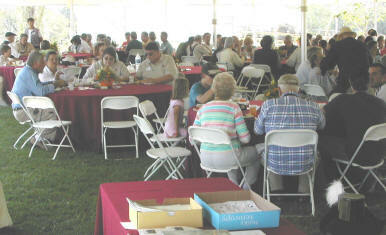 Two great Sunday lectures concluded the 2007 speaking season. 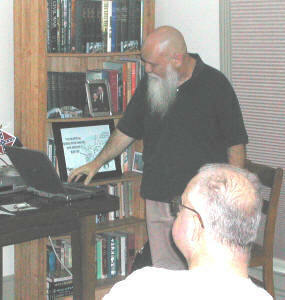 On September 29th, Richard Deardoff spoke on Civil war medicine and on October 28th, Willie Thompson spoke about Roger Pryor. Thanks to both gentlemen! !